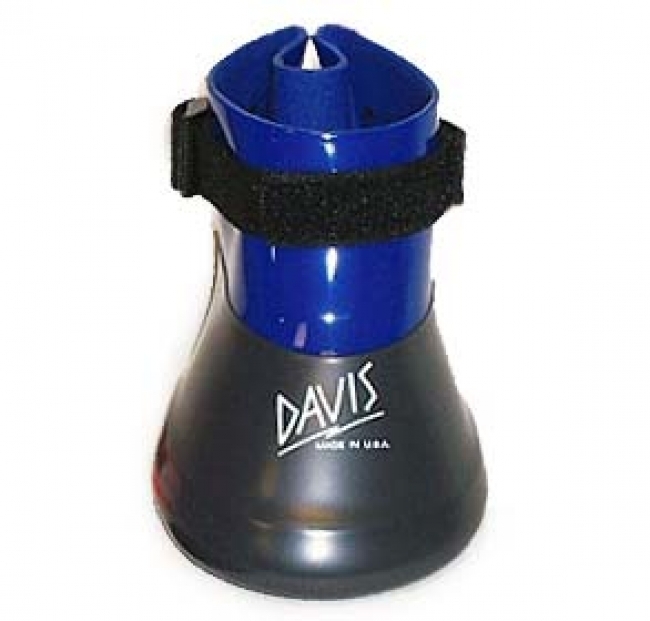 The Davis Horse Boot is ideal for continuous soaking when conditions such as abscesses, thrush, puncture wounds and other aggravated foot conditions exist. The horse boot also relieves pressure when signs of bruises, corns or cankers appear. The soft pliable upper comforts the leg during use and closes tightly just below the fetlock. The Davis horse boot opens wide for easy on-off application. The durable triple-layered bottom is made of a tough polyvinyl compound making it usable many times over. Keep one or two in your tack room or trailer in case of emergency. The therapeutic pad that fits into the Davis Horse Boot with new fiber matrix technology is now included with every horse boot. When saturated with SBS Sav-AHoof Soak or Med-i-Sole gel, the pad wicks the ingredients to the affected area of the hoof without spilling or running. Size 00 (Mini Horses and Foals) to Size 6 (Draft Horses) To determine correct size, please refer to the sizing chart below. WHEN SIZING, PLEASE MEASURE HEEL TO TOE AND SIDE TO SIDE AT THE WIDEST AREA OF THE HOOF AND PURCHASE A BOOT AT LEAST 1/2" WIDER . Size 00 3 3/4" 4 1/4"
Size 0 4 1/2" 5"
Size 1 5 1/4" 5 5/8"
Size 2 5 5/8" 6 1/8"
Size 3 6 1/4" 7"
Size 4 7 1/4" 7 3/4"
Size 5 8" 8 1/2"
Size 6 9 1/2" 9 1/2"